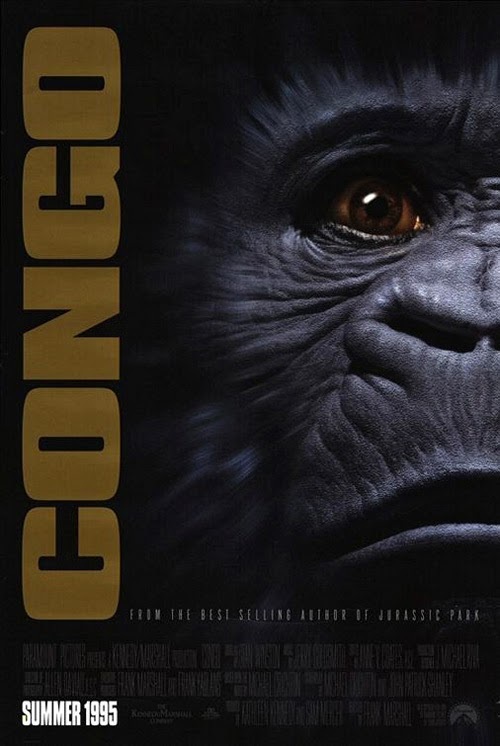 I doubt that Congo would be top of anyone’s list of Michael Crichton adaptations. Indeed, the Golden Raspberries (generally a boorishly literal arbiter of quality) gave it the dubious honour of seven nominations. I don’t think it’s nearly as bad as that rotting garland might suggest, although neither is it especially good. The picture’s one saving grace is a sensibility usually quite foreign to Crichton’s self-important storytelling; it sets out to have a bit of fun. 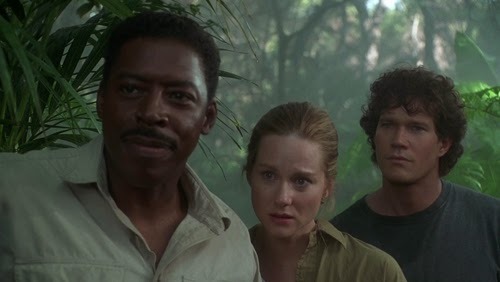 Post-Jurassic Park, there was renewed interest in the author’s work (the ‘80s were significant for producing only under-achieving directorial efforts from Crichton himself), and the prospect of utilising the CGI that brought dinosaurs to life was seen as the key to realising the apes of Congo. 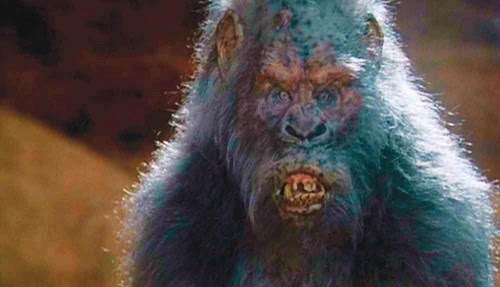 This stumbled when hair was found to be tricky (even the King Kong remake, 10 years later, renders a very definitely CG creation for all its detail; even with Rise of the Planet of the Apes, for my money suits and animatronics are less distracting). Kathleen Kennedy sequestered Stan Winston to make ape the suits, which are pretty good for what they are, and brought in hubby Frank Marshall to direct. As I understand it, Crichton wasn’t overly impressed with the results and wished he’d been consulted. I don’t think that would have helped matters, as a big part of the picture’s problems derive from his source material. Crichton was inspired to write a King Solomon’s Mines-style adventure, and pitched it as a film even before he’d written the novel (which was published in 1980). So this is a tale of lost cities, valuable diamonds, strange tribes, exploding volcanoes and hitherto undiscovered animal species. And, being Crichton, cutting edge technology. In the novel, the diamonds were required for boring old semiconductors. The movie changes this so they now power communications lasers. Much sillier and zappier, and therefore appropriate to the general tone. Also to be learnt from Congo; African countries in a state of political upheaval are a whole a lot of fun! Did I mention the talking ape, Amy? I guess she’s the key attraction. I’ve never really seen the appeal of monkey movies, Planet of the Apes excepted. Their underling anthropomorphic tendencies don’t draw me in, and having one talk in a computerised girly voice derived from sign language does nothing to persuade me otherwise. But this is element makes it abundantly clear; the only way to adapt the novel without throwing out half the plot is to embrace its essential silliness. 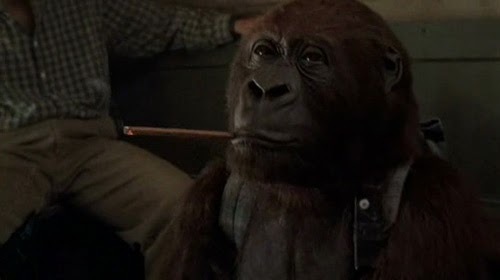 With a talking ape you can’t even rely on a sub-Indiana Jones semi-seriousness. 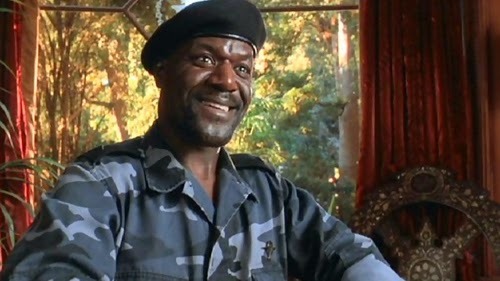 Having said that, Congo probably has more merit than the most recent Indy movie (it’s a close call, but at least Congo makes me laugh in places). 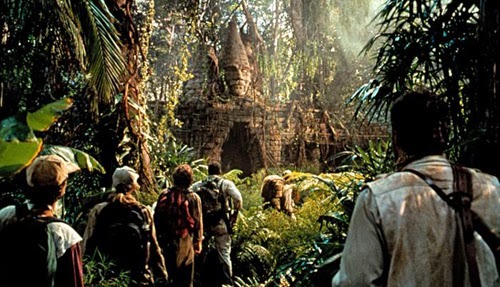 The production actually bothered going to Africa to film, while Spielberg and Lucas showed stayed at home. 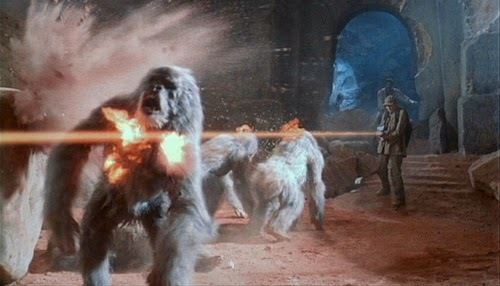 If Crystal Skull looks like it was filmed entirely on sound stages (even the bits that weren’t), the joins in Congo are readily apparent, particularly during the lost city climax. That seems appropriate, however. I can’t imagine any version of this movie not being cheesy. If it had been made during the ‘70s it would have featured Doug McClure. As such, Frank Marshall is exactly the right guy for the job. Spielberg’s long time producing partner has only directed four features but could have directed 10 for all I knew. He’s so anonymous that I confuse him with another of the Spielberg family, Joe Johnston. Marshall debuted with Arachnophobia, trumpeted to be Jaws for spiders to public indifference. I suspect it was too formulaic in its adventure-comedy styling, aware that a determined effort to make spiders scary would be a tougher sell than it seemed. He followed it with plane crash cannibalism, Alive. He’s competent, but so bland. You could interchange his with Johnston’s work on the same year’s Jumanji and I doubt that anyone would notice the difference. Confusing the key personnel seems to be a running theme for me with this movie. I had the vague recollection that Chris O’Donnell was the lead. 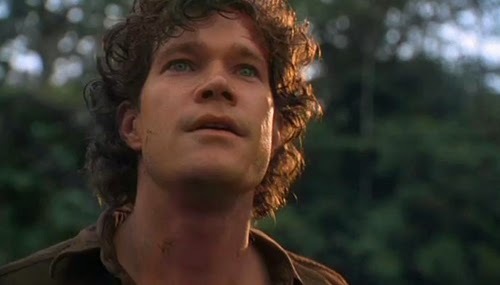 Remember O’Donnell, the least memorable would-be young star of the ‘90s? I guess devotees of NCIS: Los Angeles will respond in the affirmative. I’ve never troubled myself with it, and I doubt I am missing out. Having also never bothered with Nip/Tuck, I had no idea who actual lead of this picture was even on seeing his name. The visage of Dylan Baker only drew blanks. Was this the slightly less shlubby older brother of Seth Rogen? What had the director seen in him? What had the director seen in the script? Michael Crichton’s name in bold letters, probably. Baker’s ape fancier is as unengaging as Marshall’s direction, so they suit each other perfectly. It could have been so different. 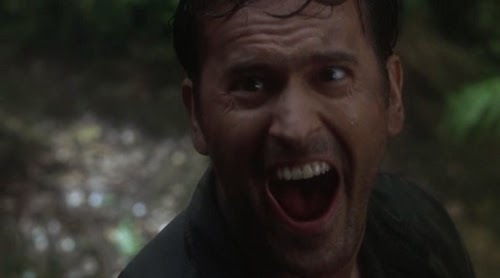 Bruce Campbell, who appears in the prologue as the leader of the lost expedition that ignites the plot, was up for Baker’s role. Instead he received the consolation prize of a character that is offed in the first five minutes. He’s a blast during those few minutes, coming on great guns and with lines like “This whole place does the shimmy!” you’d think he was adlibbing. The makers add insult to injury by dangling the carrot that he might be still alive (Laura Linney’s motivation for going in search) only for his (or an extra’s) corpse to show up during the third act. But, imagining Campbell as the lead, the movie suddenly makes sense. 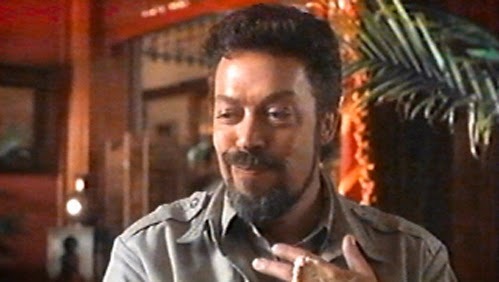 You can see him trading ham with Tim Curry, Delroy Lindo and Ernie Hudson. 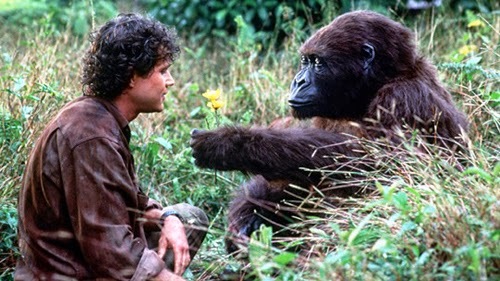 And the grating cuteness of the gorilla expert and his ape companion takes on a whole new dimension of self-awareness. The picture instantly becomes a camp classic, making a virtue out of all its deficiencies. The point where Baker, the animal lover, pulls out a gun and starts killing angry apes becomes hilarious if Campbell replaces him. In the final film it is spectacularly misjudged. A movie that, if it has any message, is about man messing with nature rather than preserving it (a hot Crichton theme that, interfering with the natural order) climaxes with the protagonists blasting the aberrant new species into extinction. And we’re presumably supposed to go along with this? I mean, it is funny because it’s such an oblivious choice. And the sight of Laura Linney laser-zapping the crazed creatures is spectacularly silly ("Put them on the endangered species list!"). The novel speculated that these apes where gorilla/chimpanzee hybrids or gorilla/human hybrids. The latter is unsurprisingly dropped as this is very much a kids’ movie, but thematically it makes sense; the interaction between Baker and Amy verges on Max Mon Amour tenderness. If it weren’t for Timeline, Congo might even hold the dubious distinction of being the worst Crichton adaptation. Unlike Timeline, Congo was a moderate hit. It made the Top 10 of the summer of ’95 to the tune of $150m (inflation-adjusted). I don’t think anyone’s going to claim Marshall did the novel a great disservice. You can’t make a silk purse out of a gorilla’s ear. And for the first two-thirds the picture splutters along in a likably silly fashion. Come the lost city, however, and the director is engulfed with substandard clichéd action heroics and plot developments. The earlier sections had a bit of fun with the familiar tropes, but by the end they just become tiresome.